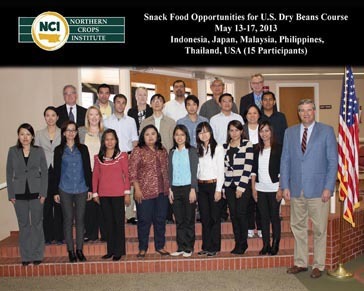 Fifteen food processors from Indonesia, Japan, Malaysia, Philippines, Thailand, and USA are at NCI to attend the Snack Food Opportunities for U.S. Dry Beans Course from May 13-17. The course is co-sponsored by the U.S. Dry Bean Council. The NCI Extrusion Laboratory is showcased as the participants spend a significant time there observing the manufacture of various snack foods. The group also toured the NDSU AES Greenhouse, NDSU edible bean breeding field plots, and the SK Food Specialty Processing Facility in Moorhead, Minn. Lecture topics include: dry bean breeding program, consumption trends, ingredients and applications, bean and corn milling, single and twin-screw extrusion technology, nutrition, starch and protein functionality, and product trends.